Christmas time in Finland starts with the beginning of the Advent season, the period including four Sundays before Christmas, called Advent Sundays. 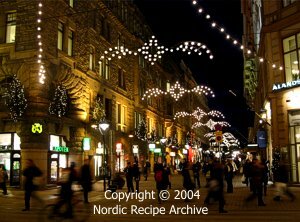 Picture on right: central streets in Helsinki are decorated with Christmas lights. The word Advent is derived from the Latin Adventus (Domini) meaning "the coming (of Christ)". The first Advent Sunday, which falls between November 27th and December 3rd, marks the beginning of the liturgical year in the Western church. This is the time when people start making Christmas preparations: cleaning and decorating the house, baking, sending Christmas cards, buying and wrapping presents and planning what to serve at Christmas dinner. 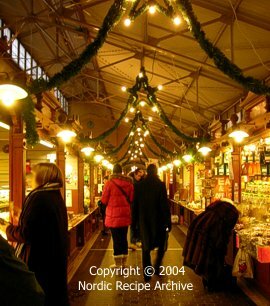 Picture on left: shopping for Christmas delicacies at the old Helsinki market hall. Shopping streets in many towns are decorated with Christmas lights. Deli counters in stores and market halls are filled with special Christmas treats. Children are given Advent or Christmas calendars by which they count the days from the 1st of December to the 24th, the Christmas Eve. Advent calendars contain a small surprise for every day  a nice picture, a small toy or a piece of chocolate or candy. Picture on right: a traditional Advent calendar with pictures. 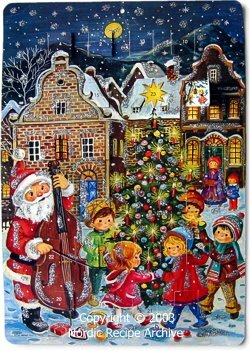 The Advent calendar tradition originated in the 1880s in Germany, from where it spread to Finland through Sweden in the late 1940s. Advent season is also the time for many Finnish companies and employers to organise pre-Christmas parties, called pikkujoulu (literally translated as "little Christmas"), for their employees, so that restaurants, winter holiday resorts and spas are often fully booked. 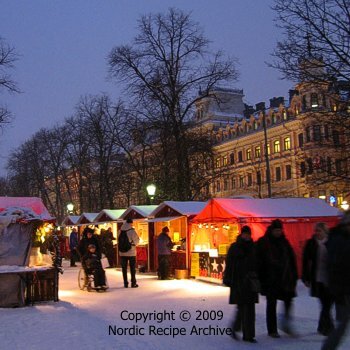 Pictures on left and below: Christmas fair stalls in the central Esplanade Park in Helsinki. Many restaurants set up a smörgåsbord or special lunch or evening menus serving various Finnish and Nordic Christmas dishes and delicacies for those who are eager to sample them already a good time before Christmas. In almost every bar, pub and restaurant one can enjoy a glassful of hot glögg, the Scandinavian mulled wine  a perfect way for warming up, seated in some dim, candle-lit corner with one's partner after a stroll in the frosty, sleety or blizzardy weather. Many clubs, charitable organisations, hospitals, women's associations, student unions, etc, will be holding Christmas fairs and bazaars selling Christmas decorations, various handicrafts, Christmas trees, clothing and food preparations like preserves, pastries, sweets, hot beverages and other products. Picture on right: Christmas decorations sold at a Christmas fair. Music performances and events, like concerts or Christmas carol sing-alongs set up in concert halls and churches, are very popular before Christmas. People go to hear Christmas carols and hymns sung, or classical music performed, especially on the first Advent Sunday, when the hymn Hosanna by Georg Joseph Vogler (1749 - 1814) is traditionally heard sung in church services. Around the 21st of December, schools and kindergartens end their autumn term arranging Christmas parties with nativity plays, musical performances, carol singing etc. Children and older students have a Christmas holiday lasting for about two weeks. 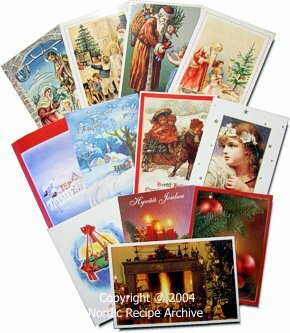 Note: in Finland, the first Christmas card delivered by post was sent in the year 1871. 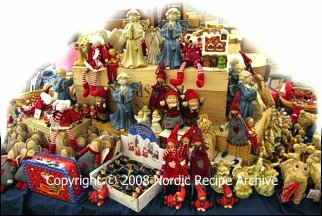 In Sweden and Finland, December 13th is the Santa Lucia Day, on which the Swedish-speaking minority of Finns celebrate St. Lucy, a Sicilian saint who died a martyr in the early 4th century. This custom was adopted from Sweden and has become known in the whole country. Santa Lucia Day is basically a festival of light and hope brought in the middle of the darkest season by Saint Lucy, represented by a young girl clad in white robe, wearing a wreath with lighted candles on her head. Read more about Saint Lucy's Day (an external link). Read more about traditional Finnish Christmas dinner here. 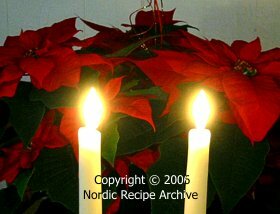 You will find traditional Finnish Christmas recipes here.